Tanda provides roster costing so you can track the cost of staff and make informed business decisions about who to roster each week. To view a further breakdown of the costs for the particular roster, you can go to the Cost View in the left sidebar by selecting the downwards facing arrow next to Staff. The Costs by day will show you the individual cost per day as well as Hours and a dollar Average value. 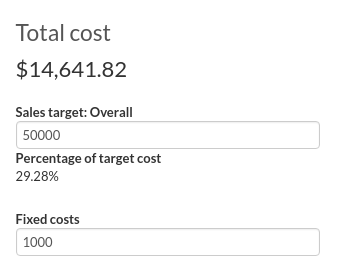 You can click the drop down arrow to the right of each day to see a further breakdown of costs per person. 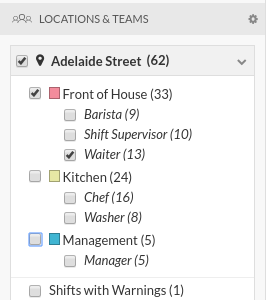 Next to Costs in the top right corner, you will now see Sales and Hours as well. If you have connected a Point of Sale System, you will notice that this box has been populated with an amount which is the average of the past four weeks on that same day. You can override this number if you wish. If you do not use a Point of Sale System, you may like to put in a sales target or past sales for that particular day. The Cost tool calculates a percentage figure which represents your roster cost as a percentage of sales. The Hours tool calculated a $/hour amount, this represents the sales amount per hour per staff member.